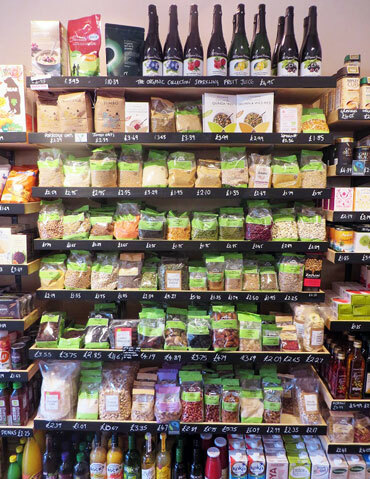 At Haworth Wholefoods we sell a wide range of wholefoods such as those listed further below. We specialise in gluten-free and vegan products, many with low or no sugar, plus organic of course. See also refills, magnetic bracelets, hampers & baskets and our favourites. Or why not take a look inside the shop itself with our 360° virtual tour. Nuts, seeds, grains, lentils, dried fruit, rice and oats. Our bread comes fresh twice a week (Fridays and Saturdays) from Blue Sky Baker of Hebden Bridge. They produce lovely artisan-made European bread, all slow fermented, vegan, etc. We take orders. NEW! 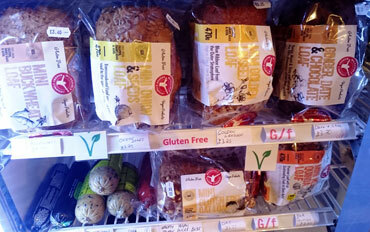 We are delighted to be stocking a good selection of gluten-free bread from the Incredible Bakery Company. This is gluten-free bread at its best  tasty and nutritious, with lots of different varieties to try. And all vegan and wheat-free, of course. Available from the chiller or freezer (see photo). We also stock organic baking and bread flour, including a good range of gluten-free flour. In addition we have baking ingredients, such as herbs and spices, sugar, salt, stock, yeast extracts, baking powder, etc., along with fruit syrups like date, agave and maple. A selection of plant milks, such as soya, almond, oat, rice coconut, as well as fresh dairy milk. Also tinned coconut milk and vegan creams. A wide range of oils and fats, including coconut, hemp, sesame, rapeseed, olive, walnut, sunflower, almond and hemp. Tinned vegetables, such as tomatoes, beans, jackfruit, chickpeas, etc., plus tinned soups, curry and dahl, etc. Tamari and shoyu soya sauce, vinegars, miso, etc. Also pasta sauces, tomato puree, pesto, olives, curry paste, tomato, plus other sauces. See also apple cider vinegar under 'Our favourites'. Jams, honeys, chocolate spreads, patés, mayonnaise  including vegan mayonnaise. Noodles and pasta, including a good range of gluten-free pasta, gnocchi, etc. Breakfast cereals, biscuits (sweet and savoury), crackers, tortilla wraps, pitta breads and pizza bases. A really wide range of tea and coffee, chicory drink, yannoh, hot chocolate, etc. Nut butters, including peanut, almond, cashew, pumpkin, hemp and apricot kernel. Fentimans and Whole Earth fizzy drinks, water, coconut drinks, cordials, kombutcha, kefir, aloe vera drinks, etc. Chocolate and sweets, crisps, fruit and protein bars, halva, dairy free ice cream, vegan marshmallows, Goody Good Stuff sweets, etc. 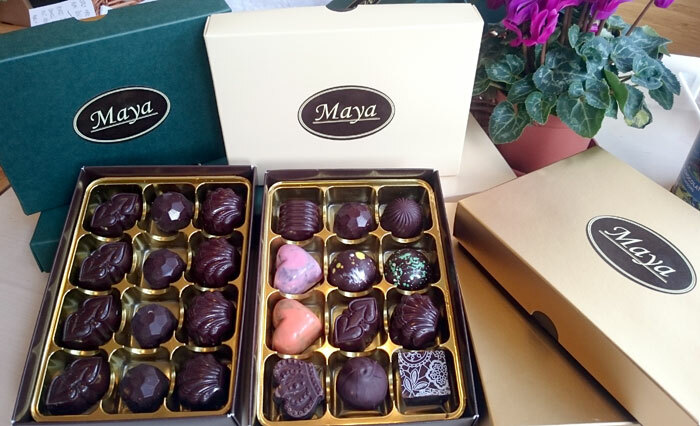 It's hard to find a really good box of vegan chocolates, but these new Maya chocolates (see photo) are excellent. 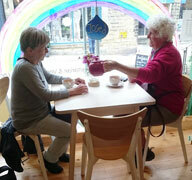 They are handmade in Hebden Bridge from quality ingredients, and are totally vegan. We stock three varieties: assorted chocolates (£14.50), mints and assorted caramels (both £13.50 each). Tofu, vegan and dairy cheeses  including locally produced organic cheese, yoghurts, vegetarian sausages and burgers, readymeals, tempeh and frozen vegetables. See also Tyne Chease and One Planet Pizza under 'For vegans'. Household necessities, such as laundry liquid, loo rolls, cleaning products, recycled and biodegradable binbags, candles, etc. Some refills available. Soap, shampoo, skincare, sanitary products, essential oils, toothpaste, deodorants, Epsom salts and other bath salts. Including the Greens range of superfoods, CBD oils, turmeric capsules and spray, magnesium, etc. Please see also our 'Policy on plastic'.